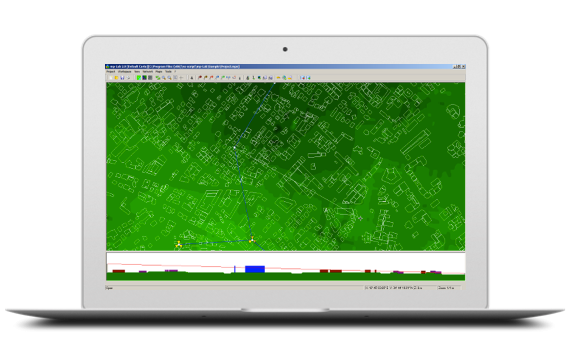 The mp-Lab Solution Suite, a complete radio network planning and optimization solution, is a professional tool that fully supports the planning of wireless networks. It supports the planning of single-system network and the planning of multi-system networks. mp-Lab can be used to plan the network using both the GSM technology and UMTS technology or the network using the GSM technology, UMTS technology, and LTE- FDD technology. During the entire network life cycle, the mp-Lab Solution Suite helps operators to complete their initial network design, network simulation, coverage prediction, and network optimization. The mp-Lab Solution Suite provides comprehensive network radio planning functions, advanced geographic information system “GIS”, and easy-to-use design interface. These features help with an efficient plan of the 2G, 3G, 4G and CDMA2000 network parameters in order to obtain the optimum planning result regarding network coverage, capacity, and quality. The mp-Lab Solution Suite provides a series of functions such as the Geographic Information System (GIS), service modeling, NE modeling, propagation modeling, prediction, capacity simulation, parameter planning, and various analysis result output. An advanced LTE planning simulation Technology for TDD and FDD. The mp-Lab Solution Suite supports the planning of neighboring cells, frequency, Physical Cell ID (PCI) codes, and Physical Random Access Channels (PRACHs). In addition, it provides professional LTE network optimization by incorporating the rich experience and advanced technologies of all vendors such as Ericsson, Nokia, Huawei, ZTE, …and leading operators. Advanced planning algorithms: The mp-Lab Solution Suite helps users flexibly perform co-planning of GSM, UMTS, and LTE-FDD networks, thus appropriately making use of existing site resources. This accelerates the product delivery and shortens the network deployment period. Advanced dynamic simulation technology by providing high-accuracy network prediction, the mp-Lab Solution Suite helps to accurately estimate network investment and provide a low-cost solution, thus effectively reducing the overall costs of network deployment. Powerful and easy-to-use network planning function by providing a mature algorithm for inter-RAT neighboring cell planning and easy settings of planning This improves work efficiency effectively by reducing the technical requirements on network optimization and ensures the quality of network planning. What we can do with mp-Lab ? mp-Lab Solution Suite provides carriers with visibility into where and when potential is your target, details on which resources will be constrained, and scenario analysis to assess potential remedies. Using mp-Lab Network solution, your team will be able to better identify how to plan your network, where the optimization action is needed, how to defer RAN CAPEX expenditures and carefully manage capital in your networks’ expansion. With mp-Lab Solution Suite, the mastering of your network becomes your first priority, the complex expansion becomes simple with your outstanding CAPEX and OPEX efficiency. At the platform of mp-Lab Solution Network is a GIS designed specifically for all the powerful of a radio network planning and optimization. It features a comprehensive set of display and layering functionality, including the ability to display various Maps and to edit cell parameters directly from the GIS interface. The mp-Lab Solution Suite is applicable in network deployment, network optimization, and network expansion. During the network deployment, the solution helps you to properly plan the engineering parameters, site, and cell parameters integration, neighboring cell data, and frequency data of the network in order to provide the guidance for the actual project implementation. During the optimization and expansion of the network, the mp-Lab helps you to optimize the network parameters and verify the optimization by comparing the network performance before and after the optimization. mp-Lab Solution Suite supports most of the major deployed wireless nowaday, starting from the GSM, GPRS, EDGE network to the last one the Advanced TDD-LTE or the FDD-LTE network such as radio network planning and optimisation for UMTS & WCDMA network or radio network planning and optimisation for LTE network including Wi-Fi, CDMA2000, 1xRTT, 1xEVDO and WiMAX. Plan, optimize and follow up your 2G network design from the timeslot to the GPRS/EDGE modulation/throughput map. Mount your 3G network services with the increase of the quality of experiences within the power of a real subscriber modeling. Because of the complexity involved, mp-Lab leads your team to understand and analyse the complexity of this technology. The competition in markets requires operators to provide the best service with the best quality of service. Empowers your team to plan and create Wi-Fi networks according to the performance and capacity required by your customers. Simplify your next generation radio network design to the overall performance of the required service with the high security restriction with one of the powerful LTE Planning Tool. A radio planning tool environment is an important factor in planning, optimizing and managing of any radio mobile network like LTE, UMTS, WiMAX or GSM network successfully. Solution Suite that supports the overall radio interface planning and optimization process are needed. This implies that the tools must address a variety of fundamental functional high-level key areas like design, analysis, measurement collection integration, and core network data integration and management. mp-Lab Solution Suite addresses the key requirements to be the best planning tool environment for these high-level areas, and it also addresses particular requirements to support the radio interface planning process your network. The tremendous popularity of wireless technologies during the last decade has created a considerable expansion of wireless networks both in size and use. This fact, together with a great variety of mobile devices and numerous different services that are becoming increasingly resource-demanding modeling, have attracted the attention of many researchers into the area of radio network solution suite planning and optimization. More of that, due to network complexity, these tasks require intelligent, automated approaches that are able to deal with many factors in order to enable the design of high capacity networks with a high service quality at the lowest possible cost. With mp-Lab Solution Suite, your network modeling become your lead to a perfect engineering application and optimization strategy. TS2I International Limited offer various courses with a maximum level of focus on your team needs while minimizing the travel time for your staff. Aligned with your request, we provide basic and advanced training courses to ensure your training objectives on site.